Click here to download a PDF copy of this comment that was published in the Quarterly Journal of Austrian Economics, which includes all notes, bibliography and appendices. I am pleased to comment on Michael Watson’s paper, “Mueller and Mises: Integrating the Gift and ‘Final Distribution’ within Praxeology.”[i] I first met Michael a couple of years ago when we both participated in the Tertio Millennio Seminar in Krakow, where he was one of three dozen participants from North America and Eastern Europe, and I as a faculty member presented the thesis of my book in two lectures, much as I did yesterday in my Lou Church Memorial Lecture in Religion and Economics. John Mueller and Peter Boettke, as well as other Austrians, criticize the deterministic maximizing behavior of the Benthamite man, homo economicus, in not dissimilar fashions. One would expect that a trained Walrasian and an Austrian might part here in their joint disagreement with Becker’s homo economicus, but they equally attack Neoclassical assumptions of stable preferences and market equilibrium. Their attack is dissimilar in the respect that Boettke argues that human ends can vary from concepts, to things, to people, etc, and rejects equilibrating equations, while Mueller believes that ends are ultimately always physical persons. I can agree except for his attributing to me the view that “ends are ultimately always physical persons.” As I point out, one great advance of Augustine’s over Aristotle’s philosophy and economic theory was that Augustine succeeded where Aristotle had failed, in devising a single theory which embraced both God (who is a non-physical person), and man (who is a physical person). 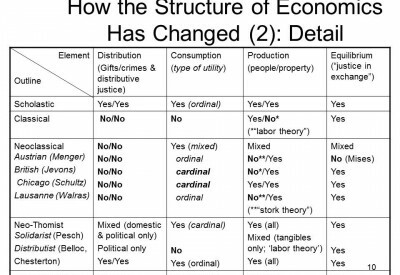 Despite Peter Boettke’s and my agreement in some criticisms of the Chicago School, as Michael notes, I do mention that the Austrian School’s theory suffers from essentially the same gap in its own version of neoclassical economics. In a series of conversations in Krakow and since, I challenged Michael to inquire into the treatment within Austrian Economics of ‘final distribution’: gifts/crimes at the personal level and what Aristotle called “distributive jusice” at the family and political levels. 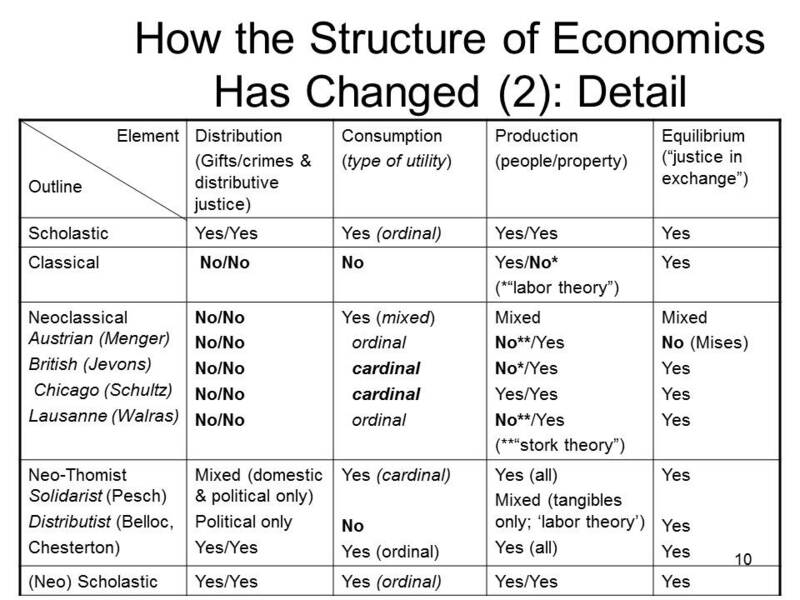 As I mentioned in my Lou Church Memorial lecture, this gap in Austrian economic theory is also reflected in Alex Chafuen’s excellent book, Christians for Freedom, which (besides correctly attributing the theory of [ordinal] utility to Augustine of Hippo) shows that the theory of final distribution–including both personal gifts (which he calls “donations”) and distributive justice–was central to scholastic economic theory. G.K. Chesterton once remarked, “Many a man has been lucky in marrying the women he loves. But he is luckier in loving the woman he marries.”[viii] The first is a deep or passionate affection (In McCaffrey’s term, “a psychological state”) while the second is an act of the rational will. Most higher animals can love in the first way; only persons love in the second way; and only human persons, as rational animals, can love in both ways. One final point: The first edition of Redeeming Economics went to press in 2010, and did not take into account Peter Boettke’s papers with Chris Coyne and David Prychitko on philanthropic and nonprofit enterprises. [ix] Far from claiming to have wrapped everything up, I think that (together with Boettke, Coyne and Prychitko) I suggest a new direction for empirical research. As Michael Watson notes, I agree that Mises won the “calculation debate” with the socialists. But if there are in fact two kinds of economic transaction–exchanges and gifts–not only exchanges, under what conditions can the value of personal gifts be adequately calculated? Is a certain critical mass of exchanges necessary in order to apply calculation to exchangeable personal gifts, say, within a family? I think the question requires further research.